After a full day of working outside - hauling mulch and topsoil to where they are supposed to be and reclaiming the driveway, I decided some "little work" was in order, and decided to do some beading instead of sewing. I first repaired a bracelet a co-worker had asked me to fix for her. It was purchased from a commercial home-party company, and they had strung it on what felt like waxed cord, which had stretched and frayed. I swapped it out for tigertail and now it should be nice and sturdy for her. The other project was a lanyard for my work ID - now that we have swipe card access instead of keys. I wanted some thing neutral in color for this first one -although I anticipate making more for different seasons and/or outfits - although the beads I chose ended up making the entire thing quite heavy. It's hard to see in this not-so-good photo, but the white rounds and squares are a shell-like material, and the diamonds are silver. In between all of them are silver lined glass beads in 3 sizes. The clip is recycled from a fabric lanyard I got at a convention somewhere over the past few years. Now to get my ID punched to fit in the clip and I will be all set to go. I still need to take photos, but the binding on the Boy Scout Quilt for Hubby is DONE. The Munchkin and I gave it a trial run with a mid-afternoon sofa snooze - works great! And I made 3 more pillowcases. My goal is another 4 by the weekend so that each of my visitors will have their own new pillowcase during their stay. Tomato bag update - we have fruit!!! On at least one plant. It's been raining since then so I have not been out to check again. All 6 plants seem happy and healthy. These are the curtains in the Munchkin's room. The curtains I made about 2 years ago when I "transformed" his room from baby nursery to little boy jungle room. The curtains I hung up unhemmed because I was not sure how long I wanted them to be - and needed to see how the lining hung in comparison to the front panel. The curtains I 'just' hemmed - today. Two pairs - 8 hems total (lining and front panels). Oh well -they are clean, pressed, and hemmed - now watch, the Munchkin will decide soon that he wants something else in his room. I've been making progress in dribs and drabs this past week - a quilty project is giving me frustrations and is now in a little heap in the corner - while I have moved on to other things. Lazy Girl Designs just came out with a wonderful new bag pattern - Claire. You can read lots and lots about Claire on Joan's blog, including seeing the Claire that my Lazy Sister Sue posted, making her the first one to tell us about her Claire. I was having difficulties picking my fabrics on this one - there are three different fabrics in the cover, and though I had a lot of pairs in my FQ stash that I would have liked to use together, I did not have any trios that did it for me - except for some I have set aside for a gifty project and so are off limits. Having seen pictures of all of Joan's samples as she shared them with her Yahoo Lazy Girl group, and actually having held a Claire in my hands prior to the pattern going to print - I was full of all these ideas and just could not decide. Today - on my way through JoAnn's in search of children's scissors for the Munchkin, I noticed a cool red floral FQ - where the flowers looked almost like popcorn to me. And if you ask anyone - anyone in my family -they will tell you how much I LOVE popcorn!!! My life in Japan was frustratingly incomplete until I found a source of raw popcorn kernals and could make it the old fashioned way!!! Got me through many bouts of homesickness I'll tell ya! In addition to being a fun print - this red combo really felt summery to me, and gets me geared up for our annual big Fourth of July picnic - I think our guest list this year is around 50 for fun and food in our backyard. This put me in the mood. Don't know if you can see it well in these photos - but the red on red has almost a starburst/fireworks motif. Anyway - I found my trio -and got to sewing after the Munchkin went to bed. About 2 1/2 hours later - here she is - my finished Claire. I opted for less variety in the inside -using a white on white yardage for my lining, and a second FQ of the polka-dots for the inner pockets. I have enough left over for a Wonder Wallet, too! Oh -and over the weekend I finished up a pillowcase for my father-in-law for Father's Day. He's fixing up an old car, so this fabric was perfect for him. Now to figure out MY dad - who is coming to visit soon after Father's Day. Hmmmmm...... I got nuthin! ...plus they helped me shop - so I ended up with a few more yards of "manly" fabric than I went in for. Nothing for me - all for the boys. Go figure. I will bank this one for next time I go shop hopping! Tonight I decided to finish up the last of the 4 quilts that Jill machine quilted for me. It happens to be the one for Hubby - the Boy Scout quilt. I had one piece of the green with the words left over for the binding - and carefully cut my 2 1/2 inch strips, stitched them together - and then on a whim decided to check the overall length prior to pressing the binding in half. I am short - probably about 20 inches short (estimating high of course). So I need a scrap 2 1/2" wide by about 20 inches long of the olive Boy Scout fabric by Robert Kaufman. My JoAnn's does not have this particular fabric (they carry the line - just don't have this one) - and I don't know if my LQS has any left. Anyone out there working with this fabric and happen to have any scraps left over? I would be willing to piece the 20" if there are multiple scraps of the right width. Hubby was away at camp for the weekend - an adults work weekend to get Scout camp ready for the summer. He left EARLY Thursday morning, and got home at noonish today. 45 minutes after he got home, I was out the door to a quilt show. And with him handling bedtime - I was able to get 2 more finishes (start to finishes) done, which gives me 2 more in the first week of our Waun-a-Quilt summer. The crabby fabric of the pillowcase I have had for a while, and thought I could get the cuff out of my stash, but nothing was jumping out at me so I went back to the store and picked up one of the coordinates. The Cars bag is from the leftover fabric from the pillowcase I made yesterday and is for the Munchkin to carry around his "Cars cars" that he likes to play with. He has been carrying them around in a bag with trains on it - and somehow that was working for him, but just did not sit right with me - not when I could coordinate things for him. The quilt show was interesting - I went by myself, which was not nearly as fun as it would have been if I had gone with someone else - I chatted with a few people as we looked at the quilts and browsed the vendors, and I ran into one co-worker that I did not know was a quilter, but most of the time I was walking through alone. I took a few pictures -will probably share those tomorrow. Tonight I will just share my 2 finishes - and the first peek at Purple Miranda I.
I got a couple of sewing sessions in this morning - the Munchkin and I took a mid-morning break to restock some videos and toys (and coffee!) upstairs - and then I was at it again. I finished 2 different pillowcases - one for a birthday party this afternoon, and the other one for the Munchkin. Both of these were start to finish projects - and I did a bit of stash busting with the black flange and the cuff on the Cars pillowcase. The star fabric on the hockey case is a staple fabric I like to use for the body of pillowcases - it is nice and soft and cool on your face, but the stars give it a nice little dimension. It is a mid-range price fabric at JoAnn's, too - so when I have a good coupon or there is a good sale, I like to stock up on this one. It also makes a nice white-on-white for other projects. I like to use this neutral for most of my case bodies for 3 reasons. The first is cost - I can do a novelty fabric cuff with 1/4 yard and not break my budget. The second is quality - sometimes I find the novelty fabric I want, but it is not a nice smooth soft finish for sleeping on. The third is best described as "restfulness" - I once had someone comment that the pillowcase I made was nice, but that the fabric was very busy and they did not find it restful when going to sleep. I usually evaluate the focus fabric I have, and then decide what approach to take on a case by case basis ('scuse the pun!) 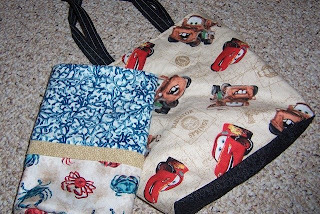 - you can see with the Cars fabric that I opted to use that as the body and use stash for the cuff. my mom ends up planting her tomatoes and training them to grow up cattle panels. this would such be easier on her. also, train your dogs to NEVER run through the garden, always around it! smooshed plants, yikes! The regrets? 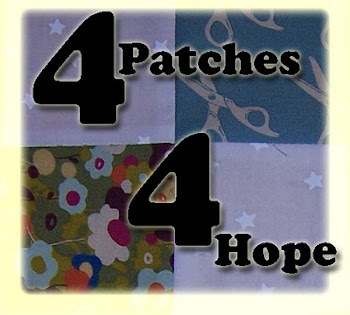 Due to unforseen 4 year old obstacles, these did not get sewn up this week as planned and so will NOT be going out in tomorrow's mail. Cindy - I know your address. Jill, if you can email me your new address I will get these out to both of you as soon as I get them sewn up. They will most definitely keep until next year if necessary. The Munchkin took a long time to fall asleep tonight -and since the sewing "nook" is in the attic directly above his room I did not want to tempt fate by heading up there. So I "finished" dishes and laundry and a few blog posts, and now I am working on finishing a bowl of ice cream. And I am enjoying a bowl of fresh cut peonies. Some crafting nights are just not meant to be. Purple Miranda I is DONE!!!! No pictures though - since I and II are identical I don't want to give away the surprise. OK - so the competitive side of me was tempted by a quick finish and a finish a night - in addition to encouraging each other, our fearless Prolific Online Quilt group leaders are keeping score! See - I cut them out (meant to make one but ended up with all those "there's only 7/8 of a yard left on this bolt -do you want it at 50% off the current price" situations - and had enough to make 2, and then some) - and then got my new machine so thought "hey - these would be great to free motion quilt" -and then I chickened out. I have practiced FMQ some - but these were for someone else - and on a bag it is really FRONT AND CENTER - and I was not confident. 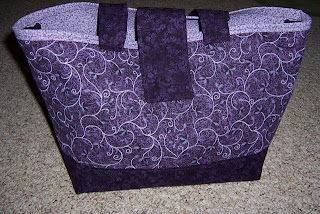 And then recently - after fondling Lazy Girl Design's newest bag, Claire, who is not quilted but uses fusible batting, I put two and two together and decided that Purple Miranda I and II would NOT be quilted - but rather fused to fusible batting. The fabric pattern is swirly enough to stand on its own without the addition of the quilting, and I would be that much closer to having these done. So a month later - I finally started. And although I did not finish Purple Miranda I tonight - I have the "bagsket" part done - the body of the bag and all the pockets. I just need to add the straps and flap and cinch tabs. If everything goes well, it should be done tomorrow. Oh my - 400 posts snuck up on me when I was not looking. To celebrate -oh I think I will give away 4 hanging tomato bags- 2 each to 2 lucky winners. Leave a comment with your favorite gardening tip and/or horror story to be entered. Contest closes midnight on Friday, June 5th so I can get these out in Saturday's mail - as we are rapidly running out of planting season! OK - so these are some of the languishing projects previously mentioned. I have not gone completely through the boxes and bags and bins and such -but this is most of them, and part of the cheerleading deal is to post our lists. So here goes - not in any particular order of priority - although someone would be VERY happy if I would "just finish that first item already!!!" 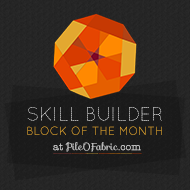 The Prolific Online Quilters have put on their cheerleader uniforms and picked up their pom-poms, and we are encouraging each other to finish up projects that have been languishing. Tonight, after battling the skeeters to water my garden (forecast said 60% chance of rain at 9pm, radar at 8:30 PM showed NO sign of rain - I opted to water - in the dark) I decided to see if I could finish a sewing project, or two, or more. Well - it was to be ONE - and only ONE. See - ever since I started making fancy pillowcases with cuffs and trims and all the bells and whistles, I thought it would be nice to use the same technique of hidden seams and no raw edges to make a cover for my rice bag - it's own little pillow case. So I figured out the measurements, and as I manage my scraps of novelty fabrics, I have been cutting little fancy cuffs for just this purpose and tucking them into a zip top bag (cutting the big case area out of neutrals). My favorite of these is the bandaid fabric - which I thought would be great for those not feeling so good moments when the rice bag is needed. Well -turning the tube on the full size pillowcases is EASY - and on these little ones? Not so much. Add to that a broken fingernail, a "French Seam" that was having challenges catching all the fabrics, and just a lack of patience - and I decided that this would be my only finish of the night. (well - that and finishing a blog post, I guess). Will I make more of these? Yes! Will I pull out my handy dandy turning tool for next time? Certainly!!! Today I start an Aqua Fit class here on campus - it's a once a week class during my lunch hour - and will run 11 weeks. I have done water aerobics before - and found it was the only exercise besides walking that I really enjoyed and looked forward to doing again. Unfortunately schedules and geography have not allowed me to take a class prior to now. Less than an hour until "feet wet" - can't wait!! !